Obamacare bailout: Give me higher premiums or give me death. She was given death. 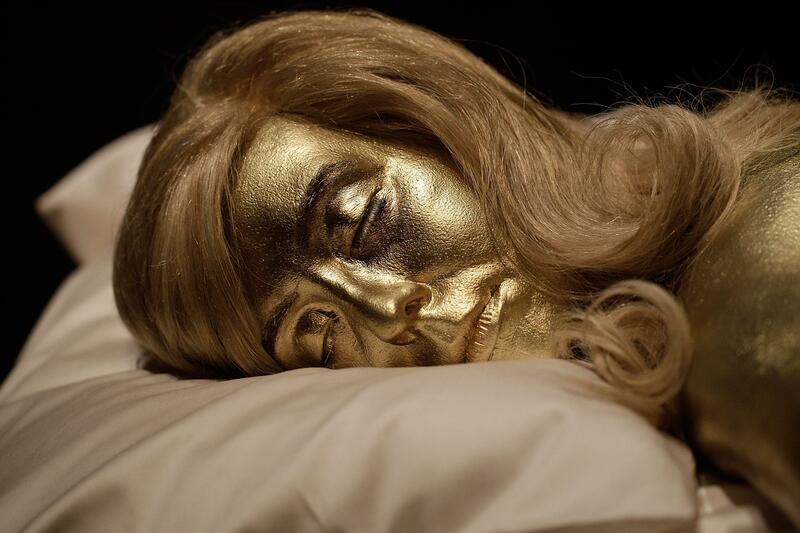 A recreation of the actress Jill Masterson covered in gold paint, from a famous scene in the film Goldfinger, is on display at the Fifty Years of Bond Style exhibition on July 5, 2012, in London. The campaign against the Affordable Care Act’s “risk corridors” has gained traction since I wrote about it in November. At that time, Marco Rubio’s bill to kill the funds intended to help insurers make up the costs of riskier consumers was obviously a lark, seen—like an unfair number of Rubio ideas are seen—as a hey-look-over-there distraction from the immigration battle. It was designed to undermine Obamacare, as Cato’s Michael Cannon explained. That’s the idea—and as Sahil Kapur reports, it has finally caught on with the broader right. The key is Rubio’s description of the corridors as an “Obamacare bailout.” The “bailout” framing was nuclear-strength in 2008 and 2010 (remember Sen. Bob Bennett? No? This is why), and no one can say how long the half-life runs. And “Obamacare”? Almost as unpopular! Linking the two is like casting Ryan Gosling and Channing Tatum in the same movie, and watching the tweens line up. Insurers are already screaming about Rubio’s proposal, desperate to keep Obamacare’s subsidies even as they ask for relief from its regulations. If Rubio’s bill or something like it passes, they would have to raise premiums and thus make their plans even more unattractive than they already are – or just withdraw from the exchanges. Obamacare would, in other words, become even less likely to succeed than it already is. I mention Bond villainy for a reason. What’s the mistake that Goldfinger and Blofeld and 006 et al. constantly make? They explain the plot while they’re still time for 007 to stop it. Conservative groups from FreedomWorks to Heritage Action have rallied behind Rubio’s bill and a companion House bill, and obviously the hope is that a “no bailout” bill would gather momentum in the Senate and make life difficult for red-state Democrats. But Congress just passed an omnibus funding bill that takes care of things for the rest of the year. A good chance to pressure the Senate on Obamacare—slotting the “no bailout” language in the House bill—has been lost. Even a scheme backed by Krauthammer, Ponnuru, and Cannon, all well-respected on the right, failed to gain traction in a Congress that’s been chastened by the shutdown, and is more fearful of causing a crisis to gut Obamacare.